The Realme 3 is a successor to the successful Realme 2 smartphone. 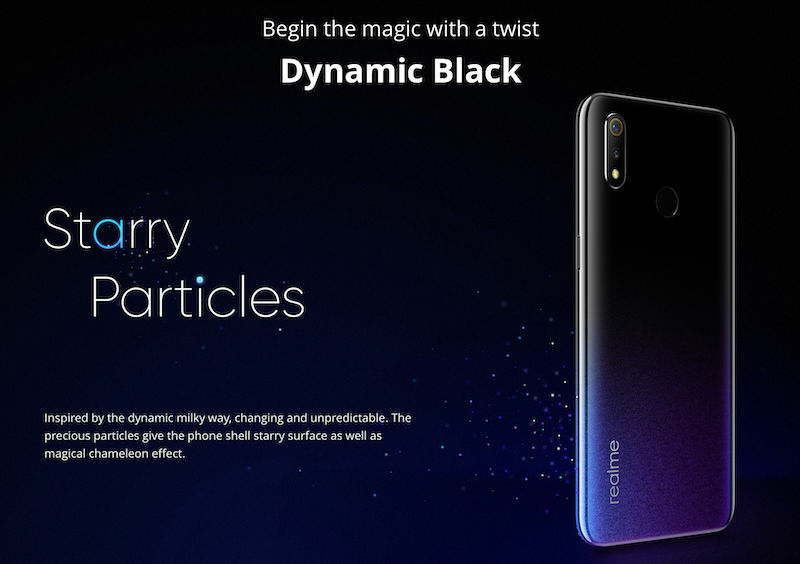 The Realme 3 comes with a slew of advancements over its predecessor that includes the design, performance, camera, and software. It has a 3D gradient unibody design with a waterdrop notch on top of the display panel. The phone has a 6.2-inch HD+ screen with 720×1520 pixels resolution, an aspect ratio of 19:9, and Corning Gorilla Glass protection. 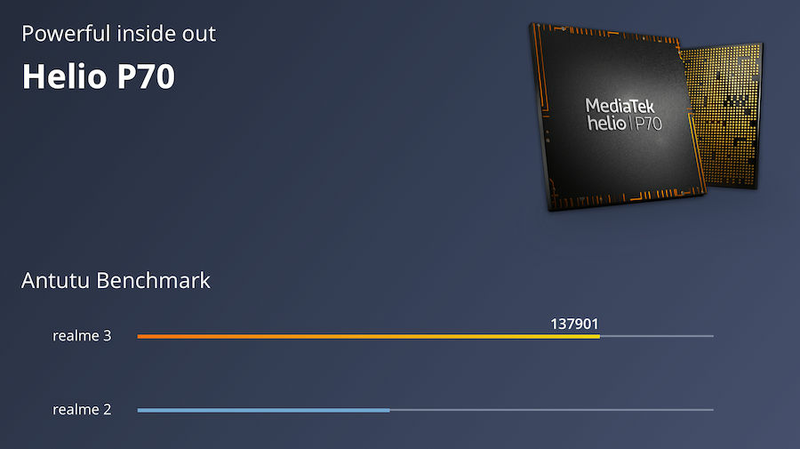 An octa-core MediaTek Helio P70 processor clocked at 2.1GHz powers the phone with up to 4GB of RAM. There is a 13MP+2MP dual camera setup on the rear and an AI-backed 13MP selfie snapper on the front. 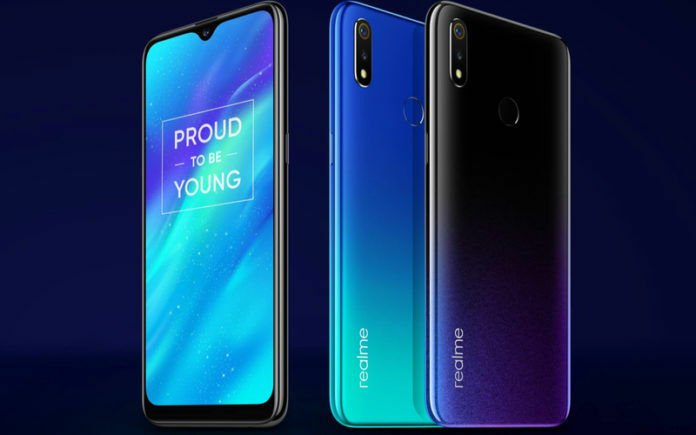 For software, the Realme 3 runs Android 9 Pie-based Color OS 6.0. A 4,230mAh battery bundled with a 10W charger completes the device. The Realme 3 price in India is Rs 8,999 for the 3GB RAM + 32GB storage variant and Rs. 10,999 for the 4GB RAM + 64GB storage model. It is available in Dynamic Black, Radiant Blue, and Black color options. Pros: The Realme 3's gradient design makes the phone look premium. Chroma Boost and Nightscape offer noticeable improvements in picture quality. The phone's performance is commendable, its software is surprisingly clean, and the overall battery life is excellent. Cons: The phone makes use of an underwhelming HD+ display. Its vibration motor feels quite weak. The phone still comes with a micro USB charging port. Furthermore, its price is slated to increase after the brand sells 1 million units. Summary: The Realme 3 is one of the most consistent packages you can find at this end of the market. there are some shortcomings like the HD+ screen and poor low-light performance, but these aspects can be overlooked considering its asking price. Once its price goes up, however, you are likely to be better off spending your cash on a Redmi Note 7. The Realme 3 price in India is Rs 10,950 for the 4GB + 64GB internal storage variant. The phone is available in 3 variants: Black, , Dynamic Black. The phone was launched in India on 04 March 2019. The Realme 3 is an advancement over the Realme 2. The phone boasts a 3D gradient unibody design that gives it a premium touch. There are glittery particles in the gradient design that offers a starry surface and changes the color when viewed from different angles. Not just the design part, Realme has also overhauled the software on the Realme 3. The Realme 3 ships with Android 9 Pie-based ColorOS 6.0. There is a dedicated app drawer that makes multitasking seamless on the phone. Besides, the phone has a Riding Mode feature to assist users when they are riding a vehicle. Realme ships the Realme 3 with an unlocked bootloader, which enables users to test custom ROMs on the phone. 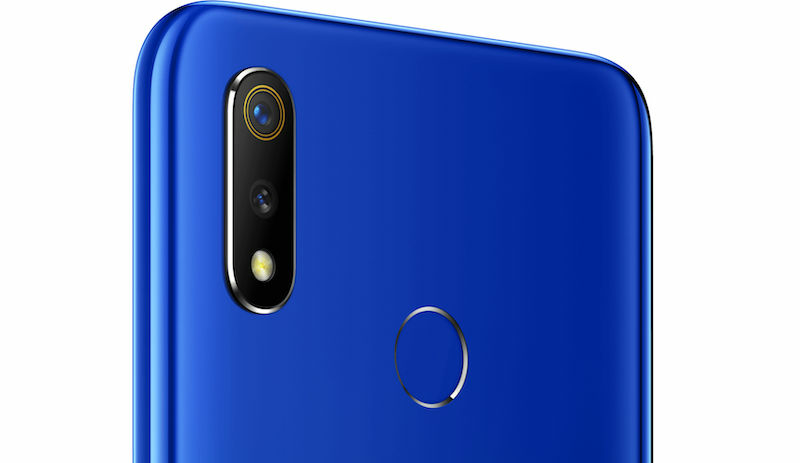 In the imaging department, the Realme 3 has a 13MP+2MP dual camera setup on the rear, wherein both the sensors have f/1.8 apertures. Other features for the rear camera include Phase-detection Autofocus (PDAF), Hybrid HDR, Portrait Mode, Scene Recognition, and more. There is also a Nightscape mode that enables users to shoot blur-free images in low-light surroundings. It also makes the shots brighter with lesser noise and enhanced detail in shadows and highlights. The phone also has a Chroma Boost feature for the camera, which improves color and dynamic range resulting in a picture with correct light balance. There is a 13MP selfie shooter on the front (housed in the waterdrop-style notch). It has an f/2.0 aperture, 1.12-micron pixels, AI Beautification, and HDR. The front camera also supports AI Face Unlock, which works on the software level. The Realme 3 comes powered by an octa-core MediaTek Helio P70 processor. The company boasts an AnTuTu score of 137,901 for the phone, which twice the score of the Realme 2. The phone comes in two RAM and storage variants: 3GB RAM + 32GB storage and 4GB RAM + 64GB storage. Connectivity options on the Realme 3 include Triple Slots/dual nano-SIM, Wi-Fi: 802.11b/g/n (2.4GHz), Dual VoLTE, MicroUSB, Bluetooth 4.2, GPS/A-GPS/GLONASS. A 4,230mAh battery backs the Realme 3 with an AI Power Master mode for enhanced output. The phone from Realme can last a couple of days on a single charge with light to moderate usage. The company even bundles the phone with a 10W charger for fast-charging. 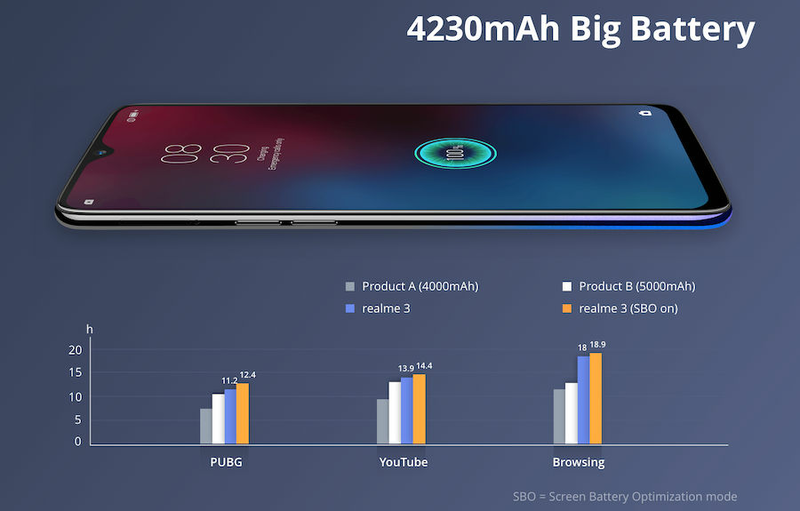 As you can see in the image above, Realme claims that the Realme 3 can last up to 12.4 hours of PUBG gaming, longer than some popular phones in the same price segment, with the Screen Battery Optimization (SBO) mode turned on.